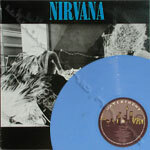 notes blue vinyl, black/blue sleeve. recognizable by the different matrix and labels. 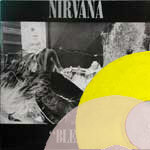 notes yellow vinyl, black/yellow sleeve. recognizable also by the different matrix and labels. 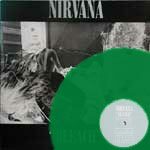 notes green vinyl, black/green sleeve. 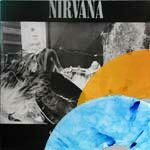 there were no official releases with this sleeve variation. 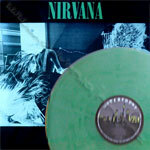 the vinyl is similar to the official green release but looks more muddy/marbled. 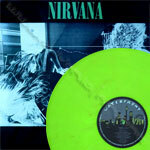 notes bright green vinyl, black/green sleeve. there were no official releases with this sleeve variation and vinyl colour. 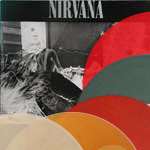 notes orange vinyl, black/grey sleeve. 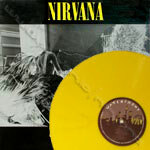 there were no official releases with this vinyl colour. 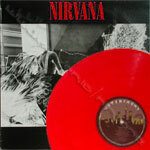 notes red vinyl, black/red sleeve. 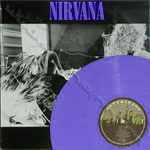 notes purple vinyl, black/purple sleeve. notes lower print quality of the sleeve, wrong code (TUPEP6) on the sleeve spine. 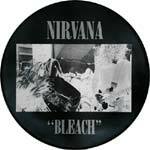 related item: official uk bleach 12"
notes reissue in orange clear and in blue/clear splatter vinyl. plays a wrong tracklist on side a, with "love buzz" instead of "big cheese". recognizable also by the different aspect of the labels. another safe sign is the width of the runout area on side a, which is around 2 cm, while in the original it is around 1 cm. the matrix is different from the original, but be sure to check all the other signs, because on at least one counterfeit the missing "MPO" and "1" have been added by hand on the vinyl: The matrix reads MPO TUPLP6 A1 and MPO TUPLP6 B1. All letters are hand written and in capitols. The MPO is so scratched out that you really can not even read it. The A does not close all the way on top so it all most looks like a capitol H. The TUPLP6 A and the TUPLP6 B look nice and smoothly etched in to the vinyl. The crossed out MPO and the 1 are both etched in much deeper and stand out as very different looking then the TUPLP6 A and the TUPLP6 B. To me, it appears as the MPO and 1 were added by hand. The run out is also a littler larger on this copy then on the original. 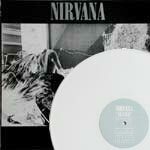 The vinyl is white but it is slightly marbled with off white throughout. 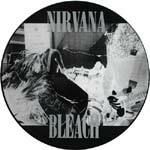 When you play the record the fifth track is Love Buzz. The rest of the album matches the track listing on the cover. 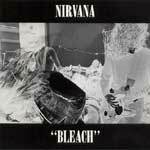 I did notice that Big Cheese never played anywhere on the album. The cover looks good with no noticeable differences. TUPLP6 is the exact code on the spine. plays a wrong tracklist on side a, with "love buzz" instead of "big cheese". recognizable also by the brighter shade of green, the matrix, and the different aspect of the labels. the runout area on side a is around 2 cm wide (in the original it is around 1 cm wide). very well made, even i was convinced it was real for a couple of weeks until i checked the matrix. it is clear green, but it is still quite thick and if i hold it up to a light i can see swirls in the vinyl.